Last week I received a tweet from Andy Powell announcing that he would be live-blogging at the Future of Technology in Education (FOTE) conference. On Friday, on the morning of the event, Andy sent another tweet saying that the live-blog was available on Eduserver’s new Livewire service. And so I went along (to the Web site, not to London for the event!) and read Andy’s comments on one or two of the presentations and the comments made by others. We’re seeing increasing examples of ‘amplified conferences’ in which commentary on the talks is being made available to people who aren’t physically present. This is even more effective if the event provides streaming video of the talks (which can, of course, be expensive) and if the slides used by the speakers are made available to the remote audience on services such as Slideshare. I’m really pleased to see this happening and it’s good to see the approaches which are being taken by Eduserv. I think this is a good example of on-the-fly professional development. And it is particularly pleasing to see this example of openness – a participant at a conference who is happy to make notes on the talks and to share them with others. As Andy subsequently told me he has “have taken a decision to live blog most of the events that I attend“. Provide a clear statement of the rights issues, such as “Please note that this live blog is open to everyone. Any comments you make on this service will have a Creative Commons licence“. Provide occasional statistics on the numbers of participants, if this isn’t provided by the software. Clarification of the status of the live-blog and ensure that any possible conflicts with other live-blogs are addressed (i.e. avoiding having multiple live blogs which fragment discussions). Clarification of whether the reporter is providing a neutral commentary on what the speakers are saying, or is giving personal comments on the talks. Are there other suggestions which others would like to make? One final question. Do we have a clear understanding of what we mean by live-blogging? This to me seems more like a messaging environment. How should we refer to a blog which is taken during a talk and published immediately afterwards, such as Chris Rusbridge’s report on sessions at the IPRES 2008 conference? I commented on Andy’s transcript of the FOTE event that I felt there was still some room for improvement in the ‘live blogging’ software space. 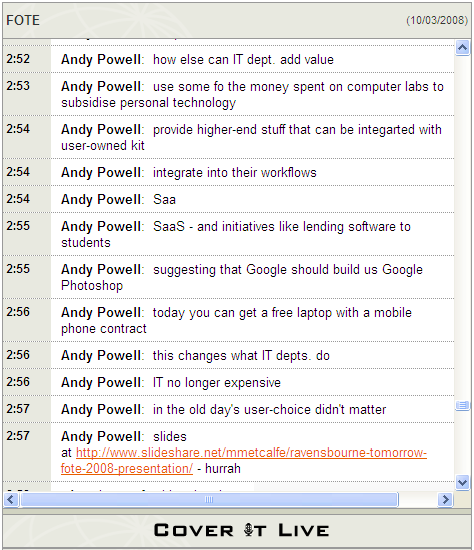 Andy (amongst others) uses CoverItLive, which seems to be one of the few specialist packages out there. However, as far as I can see, he found that the need to ‘approve’ every comment as it came in led to delays in comments appearing – and so they were often out of context by the time he had approved them. He now adds participants to ‘pre-approved’ commenters – which seems to essentially make them ‘co-bloggers’ – like a messaging environment as you suggest. However, at FOTE he then hit limits to how many people he could pre-approve, and people started to say “I’m off, you can take me off and put someone else on instead” – What a pain! However, just using a messaging environment seems to me to be different to ‘live blogging’ – this is more like a ‘back channel’? The key difference is that a blog has an author (or authors), and as such an ‘authoritative voice’. This is not the case in a back channel where everyone is equal? Whether this makes a difference I’m not sure, but I think it does? I also have an issue with referring to CoverItLive as a ‘live blog’ as it doesn’t have an RSS output. Both Andy and I say that one of the key reasons for blogging events is for our own notes. This means that when we both attend events, we are both likely to be blogging (as happened at the Talis Xiphos day earlier this year). I guess there is a potential ‘watering down’ effect here – especially at small events? One of the things I would like (and it is echoed by Andy as well) is a way of clearly differentiating between where we are reporting what someone is saying, and when we are commenting on it – something that may be clear to any participants at the event, but not to those remote readers/participants. One possible approach that occurs to me as I write this is setting up an event Twitter account (so Andy could have bagged FOTE08ap or something similar). You could follow this from a Twitter client or via RSS, reply to it to comment (no limits to this), searchable etc. In fact I might pop over to efoundations live and suggest it now! At the IWMW 2008 event I provided access to the ScribbleLive service, partly to gain experience to an alternative to CoverItLive. This avoided the authentication barrier which, as you said, can be annoying. However if we provide an open live blog service, how does this then differentiate itself from a messaging environment? I also find CoverItLive’s lack of RSS unfortunate – and in this respect Scribblelive is better. I’d suggest that the differentiator is the ‘authors voice’, but I’m not sure how exactly this makes a difference – I’m just reasonably sure that a live blog done by Andy would carry his personal tone which would make it different to one done by me. In a free for all environment like ScribbleLive I think there is no strong ‘voice’, which means that it lacks something? As to motivation, apart from experimenting and hoping to inform others, this was a substitute for hand-written notes on this occasion. I do think that’s a reasonable motivation, although I suppose one might write more things in hand-written notes that need to get censored before any kind of blogging! Firstly, thanks to Brian for the positive coverage – my live blogging isn’t getting that many followers yet as far as I can tell but it’s nice to know that the people who drop by for some or all of it find it of some value. Secondly, on the voice thing, I tend to agree with Owen. Voice is an important part of a blog of any kind. I am not trying to be a backchannel for the event I’m covering – though we did experiment with using CiL in that way for the symposium. In that sense, CiL is better than, say, ScribbleLive for the purposes of ‘blogging’ since it retains (I think) a sense of there being a lead writer with others providing additional comment. Thirdly, on the reporting vs. comment issue – I try to prefix my comments with AP: – but I’m not sure how obvious this is to people and I don’t always remember to do it anyway. I haven’t yet thought of a better way to do it though. On the use of Twitter – I absolutely hate the normal approach to this which is just to use your normal twitter account – I find this very disruptive for your followers who aren’t interested in a particular event – given lack of filtering and so on. Owen’s suggestion to use a separate account is an interesting one. I could of course simply register an efoundations Twitter account and use that for everything?? I’ll think about it – I’m slightly worried about working within the 140 char limit for a task that is already somewhat pressured at the writing end. The ability to go back and edit a live-blog (during and after the event) is very important to this particular live-blogger! Not to drastically change stuff but to fix obvious typos, places where clarity gets lost, and so on. This will be even more important at my next live-blogging event, FOWA in London this week, because I’ll be using my new EeePC’s small keyboard which is bound to induce even more typing errors than usual (if that is possible!). Sorry… one other thing. On the issue of RSS – are you (Owen and Brian) expecting a new RSS item for each live-blog or for each posting to each live-blog? The former would be more blog-like, the latter more Twitter-like. The former is catered for by embedding each CiL live-blog into an external blog – as I have now done with eFoundations LiveWire – leaving the external blog to chuck out the RSS feed. I can see that the latter would have some nice (and flexible) advantages – I’ll try and find a way of suggesting it as an enhancement to the software. Having a Twitter account – I’d go for having an ‘event’ account rather than a generic ‘live blogging’ account – this would make it easier to extract a full transcript of a single event. You really wouldn’t want to be adding an event tag to every tweet would you? Re: 140 Char limit, I’d be interested to know if you reached this for any particular line in your FOTE blog – from a brief run through I’d guess not. However – you’d be at liberty to just stream into next tweet – hit enter and carry on. Post event editing is more problematic – I can’t see a way of doing this with Twitter – although it wouldn’t take much to knock up an automatic extract of the ‘transcript’ into html/blog post, and you could edit this to your heart’s delight. It may be that an alternative microblogging system might work better than Twitter – I don’t know what the capabilities of Jaiku, Pownce etc. are – perhaps others can comment. Re: Rss feeds – I was thinking of having an RSS of each posting to the live blog – so more Twitter like than blog-like. I agree that what you’ve done with LiveWire covers the latter case, but the transcript itself isn’t re-usable in anyway, or consumable in any other format. I’m sure there are other possibilities – the point is that RSS is generally more re-usable etc. Here’s a good post on using Live Tiwttering (http://www.livetwitting.com) at Events. I’ve just put a commented on Owen’s blog but thought that it may be worth noting here as well (or a pathetic attempt to advertise my own ill-thought ramblings). In a nuthshell, I ponder if a conference-specific friendfeed account could work. It can then follow the twitter and blog updates from a number of people, and other sources as well. It also has a good commenting (and ‘like this’) function, and provides an RSS feed as well.